Birds in the wild can groom their nails, or claws, on the rough branches of trees. They can bathe in the rain, the ocean, bay, or brook. But what about pet birds? They also have a natural need to groom themselves. I found two items from Polly's Pet Products that look like efficient, bird-friendly places to perch, if you've trained your bird for special time outside the cage. The first is a Shower Bird Perch that attaches by suction to your shower wall. I wish I had this when I had my cockateil. He loved being with me in the shower, but would sit on the shower rail above the water, too afraid to take the direct hit of the shower while sitting on my finger. 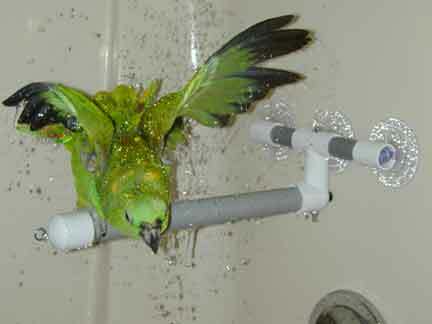 This perch, if placed appropriately so that your bird can get out of the direct shower if he likes, is perfect. The Shower Perch, which comes in small and large, can also be used as a window perch. The other grooming must for pet birds is a place to sharpen his beak and nails. This perch is just perfect for that, with its rugged, sand paper-like surface. The perch also works well for training new birds to venture outside of the cage or, more likely, to safely land the first few times he's let loose in a room. 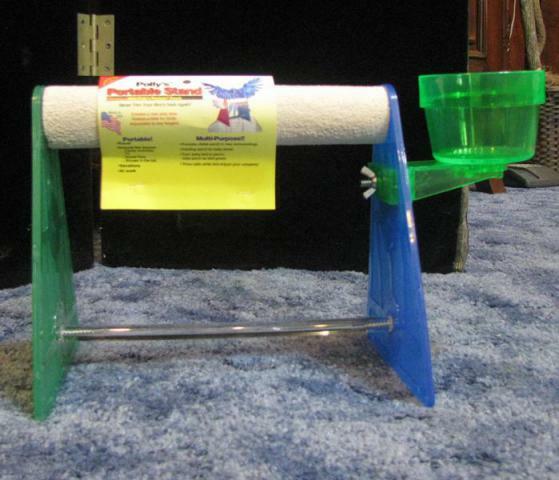 The Grooming Bird Stand is also available in small and large. Your bird, whether he's a parakeet or a Macaw, will love these grooming tools and you will enjoy sharing his pleasure with him.